An ever-growing market, kids offer a world of business possibilities for inspired entrepreneurs like you! From party planning and gift products to cooking classes and clothing, this book covers the hottest businesses within the flourishing kid-focused industry. Are you inventive? Fun? Have you been called a kid at heart? If so, let us introduce you to an up-and-coming, fresh-faced market with unbelievable purchasing power - meet today's kids! An ever-growing market, kids offer a world of business possibilities for inspired entrepreneurs like you! From party planning and gift products to cooking classes and clothing, this book covers the hottest businesses within the flourishing kid-focused industry. Providing insider advice, tips and tricks along the way, our experts take you step-by-step and show you how to discover your specialty, legally and financially establish your business, manage day-to-day operations and so much more! Reader Jeri Nevermind of Idaho says,"With banks failing all over, it looks like we are heading into tough economic times. Lots of people may soon be looking for new jobs. 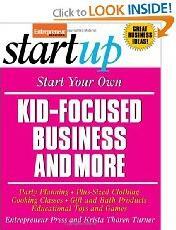 So it's very useful to find a book like this, chock full of ideas about how to start a kid-centered business." "Some of the ideas, such as starting a party planning business for kids, would be perfect for a stay at home mom who just wanted extra income. Other ideas that would work for a stay at home moms would be making plus sized clothing for kids, and giving cooking classes for kids." "Other ideas, such as making, designing, or producing kid toys and games, would require start up funds and hiring employees. The book covers all these topics, as well as marketing, advertising, and information about how to approach banks and others places for loans." "Whether it's how to deal with finding retail and commercial locations, setting up trade show booths, drafting contracts, this book has it all."